With cleantech in the narrow sense one still means manmade technologies. For example solar panels, photovoltaic (PV) modules, high efficiency heat pumps and so on. The forerunners of cleantech industries are as always industrialized countries like Germany, Japan, China, Denmark and USA. There is no real paradigm change in the narrow sense meaning of cleantech; some older technologies are replaced by their more energy efficient and more environmentally friendly counterparts. It could also be regarded as general improvement in technology. Luckily, especially for people living in less industrialized countries, there is a wide-sense meaning of cleantech which also covers the technologies of nature. Cleantech in the wide sense means all kinds of solutions, manmade or natural, that improve the quality of life, save energy and protect nature. In that wide sense, cleantech is a real paradigm shift because one is not looking for only manmade equipment and machinery for a better life. This paradigm shift reminds me the transition from the classical economy to ecological economy. Take water purification issue in an aquarium (biological filtration of the fish waste) as an example. A manmade cleantech (narrow sense) solution to this problem is an energy efficient water filter. A better solution would be using marginal plants for water purification, the technology of nature (cleantech in the wide sense). You see, cleantech in the narrow sense often means hightech, whereas in the wide sense it often means lowtech. Another example: Using an energy efficient tractor with an electric motor (possibly powered by PV modules) to plow a farm is cleantech in the narrow sense. A better solution, namely using pigs for that purpose is cleantech in the wide sense. Pigs are a better solution than a tractor because they plow and manure the farm simultaneously. That is, pigs are cleantech tractors. Still another example. Highly efficient electric cars (narrow sense) versus reducing the need for cars through better urban planning and bicycle ways (wide sense). People living in less industrialized countries shouldn’t be fooled into the ideological trap of thinking cleantech only in its narrow sense. Surely, the industrialized countries would -consciously or subconsciously- do everything for this ideological conditioning. That is how they sell their expensive hightech products to developing countries. Industrialized countries owe their wealth to the widespread belief that a better life is only with hightech possible. In some cases that might be the truth: We still don’t have a lowtech substitute for refrigerators, but in most cases it is not. For example, lowtech aquariums are much better than hightech aquariums for keeping sensitive fish (see my article “biotope in my study”). You don’t necessarily need mercedes cars, mobile telephones and plasma TVs for a happy life. We can take cleantech in the wide sense one step further: A self-sufficient lowtech life style. If you think, producing your own electricity with PV modules is an attractive idea, why not think about producing your own bio-energy for your body, namely food? 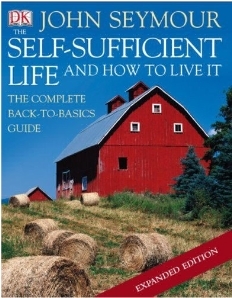 The Self-Sufficient Life and How To Live It developed a passion for a self-sufficient life style more than 40 years ago. Who is John Seymour? After visiting schools in England and Switzerland he studied agriculture at the Wye College in London. After college he went to Africa and lived there for more than six years. He managed a sheep farm in Namibia. He hunted bucks and lions with bushmen in the Namib desert. He went deep-sea fishing for a year and worked in a copper mine in today’s Zambia for six months. He traveled all over the central Africa for two years inoculating native cattle. With his unmatched experience in rural life he developed a passion for a self-sufficient life style which he could realize in his farm in Wales. He promoted self-sufficiency on typically five acre (20 thousand square meter) farms. He also founded a School for Self-Sufficiency in Ireland. Self-sufficiency does not mean “going back” to the acceptance of a lower standard of living. On the contrary, it is striving for a higher standard of living. … for the health of body and piece of mind that comes with hard, varied work in the open air. Unless you measure your quality of life with dollars and technological widgets and gadgets of course. The price you would pay in such a case is wage slavery according to John Seymour. In other words, becoming mindless termites of the modern economy. We may not wish in the future to maintain a standard of living that depends entirely on elaborate and expensive equipment and machinery, but we will always want to maintain a high standard of living in the things that really matter -good food, clothing, shelter, health, happiness, and fun with other people. We are not meant to be a one-job animal. We do not thrive as parts of a machine. We are intended by nature to be diverse, to do diverse things, to have many skills. I couldn’t agree with the quotation above: We are not meant to be a one-job animal. We have our natural interests, but depending on the circumstances of the economy we are usually forced to do some highly specialized jobs which have a low degree of relationship with our natural interests. Only small lucky minority really enjoy their jobs. Even the long domestication and indoctrination process, namely education, as preparation to our economic life does not help much in that sense. We may learn to endure boring jobs, or accept them as normality, but that is not real happiness. Real happiness may sometimes need courageous decisions such as changing the whole life style. This entry was posted on Tuesday, January 26th, 2010 and is filed under Sustainable life. You can follow any responses to this entry through RSS 2.0. You can skip to the end and leave a response. Pinging is currently not allowed. Really enjoying this article and the website in general.